Harrod Horticultural Steel Fruit Cages offer a complete fruit cage protection package for the grow your own fruit and vegetable gardener - with a combination of heavy-duty steel cage framework, high quality 16mm square mesh fruit cage side netting and the essential heavy-duty anti-bird fruit cage roof netting, you can be sure birds and other pests will be on the outside looking in! 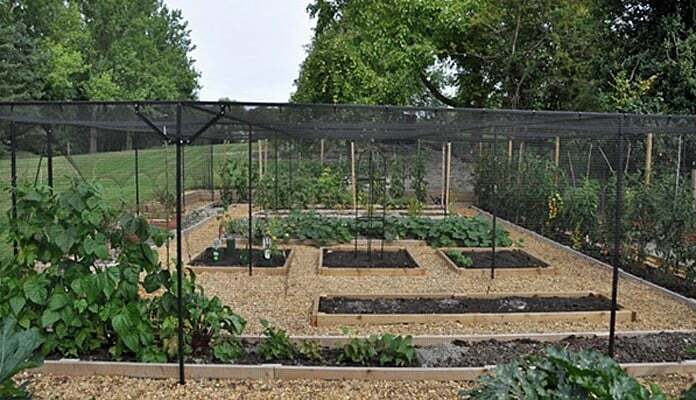 "We are delighted with our fruit cage. It has enabled us to enjoy growing fruit and vegetables without worrying about birds, rabbits or deer. It is a smart, clean design and we assembled it without any problems. We look forward to many harvests!" "This area of the garden was a 'waste land' before we began the work last summer and now it has been transformed into a highly productive veggie patch. The products supplied from HH have been invaluble - wouldn't have been able to do it without. 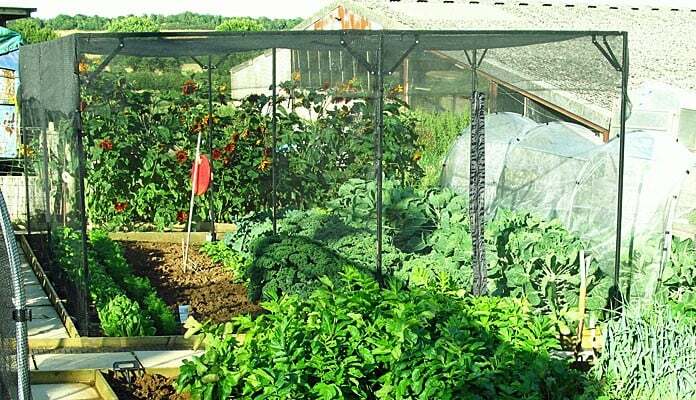 And I did do quite a bit of research before I decided to use the raised beds and the HH fruit cage, and came to the conclusion that both were the best product on the market in terms of quality and value for money. 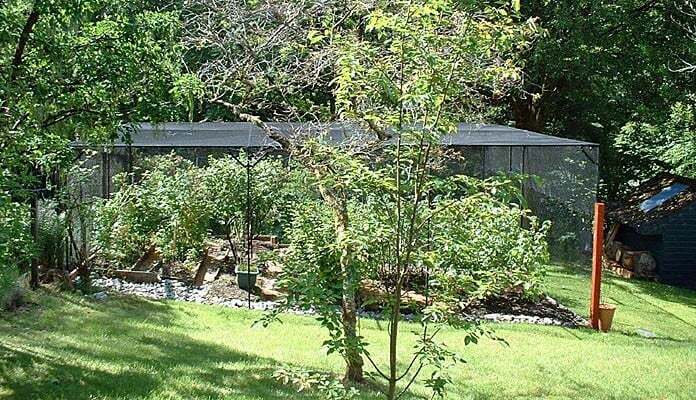 The superior raised beds are perfect and so easy to garden from. The soil here is a mix of heavy clay, chalk and flint so having imported topsoil and compost in raised beds has been a good investment. I also used your heavy duty membrane around the beds and generally around the area to suppress the weeds etc - again a very good product which certainly stands up to the job. 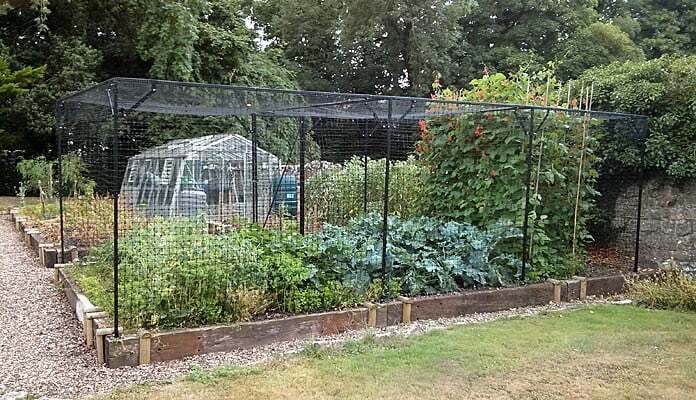 We have deer, foxes and pigeons to name but a few 'pests' who like to eat crops so having a fruit cage was essential. 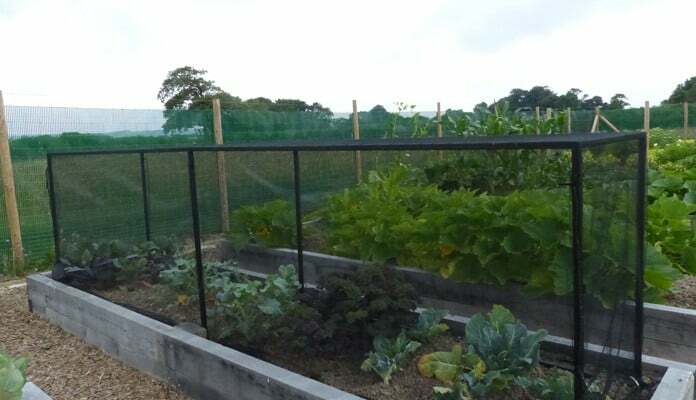 I worked with your colleagues in the personal design team and you manufactured a bespoke cage which would fit around the layout of the raised beds. The whole process from initial contact with Adam and the team to finishing the fit of the roof netting was painless and straightforward - the video instructions were very useful. There was a very minor problem with the door closing mechanism and a replacement was sent out immediately. Everyone at HH has been really helpful. 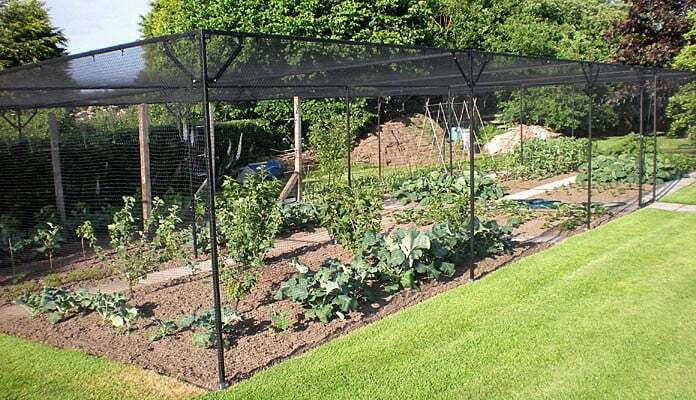 And finally I also used your wondermesh products to protect my carrots and cauliflowers from the butterflies - both have worked a treat." "I would just like to say a big thank you for the quality of service from both your staff and also the quality of the product. So easy to assemble because of the finished product and also the instructions and video. It looks as though the fruit cage has always been there"
"Your excellent handling of my needs and queries was exemplary!" 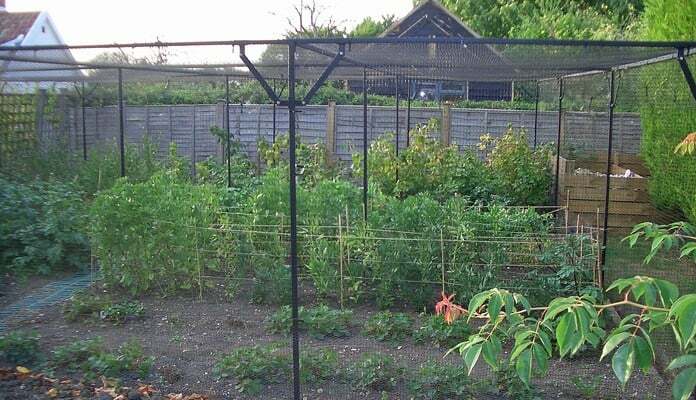 "Many thanks for your help in the purchase of our fruit cage, we spent last weekend building it and netting it. Really pleased with the quality and how it looks." 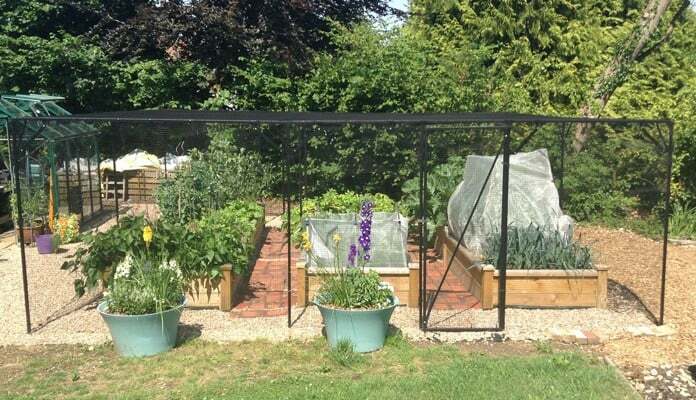 "I bought my fruit cage not for my personal garden but for a show garden at Great Park Farm, Catsfield, East Sussex where I intend to use the fruit cages to demonstrate how to grow soft and top fruit in a small space." "Our old fruit cage had long seen better days and we were keeping an eye on gardening catalogues for replacement possibilities. 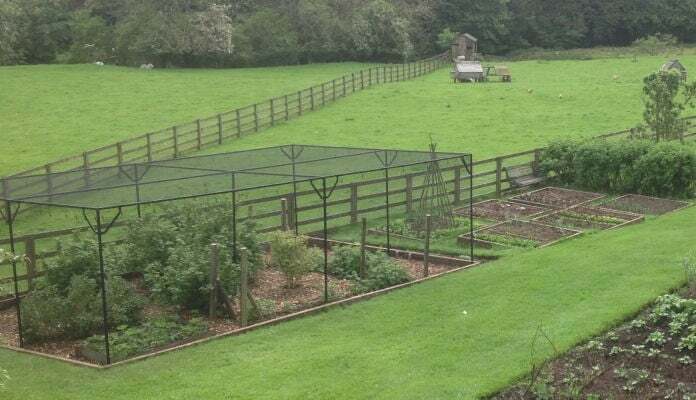 Harrod's offer of made to measure cages for sloping ground seemed a good choice and so it proved. Good service,well made and delivered on time. Can now concentrate on pruning and picking the raspberries, blueberries, black, red and white currants, gooseberries and other fruits ." "You may see that the cage contains selected vegetables, not fruit. This is because unprotected some vegetables are eaten by local roe deer that enter the garden at night, or even in daytime. 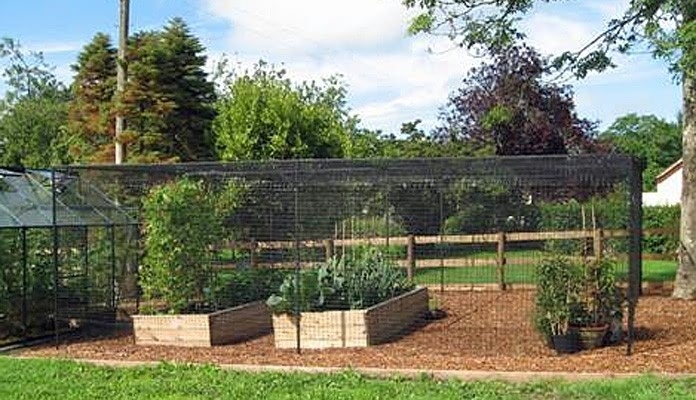 The cage encloses a raised bed constructed with timber sleepers with the cage frame foot plates screwed directly onto the top edge of the sleepers. 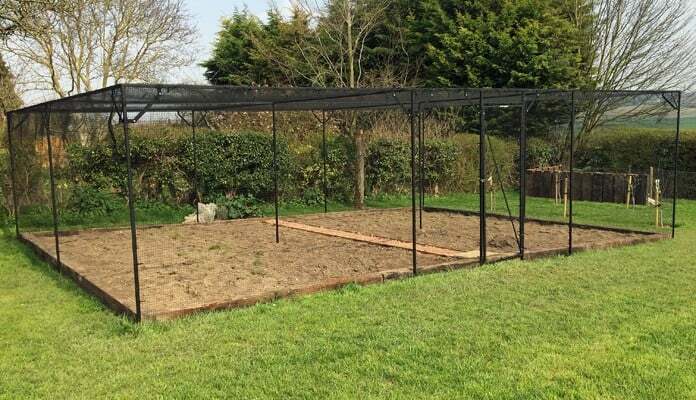 The cage has proved to be entirely satisfactory and as an engineer I was very pleased by the quality of the materials in the steel frame, the accuracy of the manufactured components and the clear assembly instructions. Assembly by one person was possible although at times two of us were engaged to speed up assembly which was easily accomplished in less than a day. This is a good British product of which Harrod’s may be proud." "Ordering and delivery were simple and advice given was good. Delivery was ahead of time and the driver was very good with the unloading. 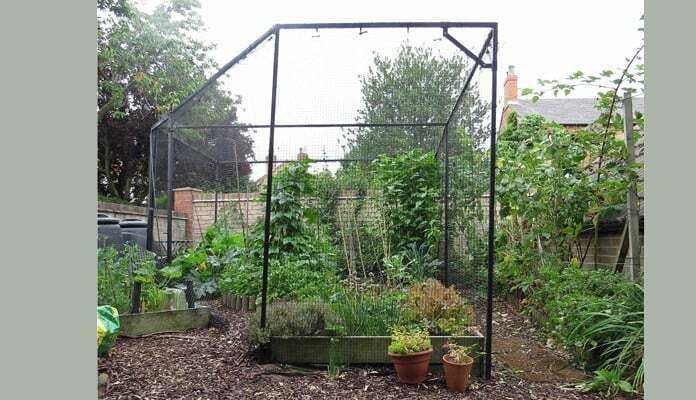 Due to adverse weather it was a few weeks before I could erect the cage, but this has now been completed. Erection was easy and I did this with no assistance. The ground on which the cage stands slopes slightly in both directions but the cage copes well with this. One thing I did discover, and I should have realised this, is that the door needs to open out if the ground at the back of the doorway slopes down away from the door. 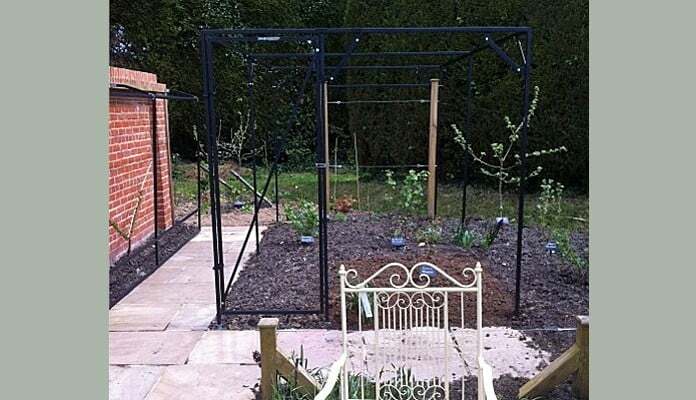 I bought rabbit wire with the cage but have not yet put this in place, partly because I will need to sink the wire into the ground and this I will now do in the autumn." "I am writing to thank your sales and design team for the help and support you have given us for our purchase of a bespoke fruit cage. From the very first call to your sales team we have been looked after very well. Clear explanations and detail were provided (within an hour) of how to correctly measure up for the bespoke design. From that point we had all the help directly from Adam in the design team who was always on hand to help with planning information and queries. It could not have been simpler - in addition given the cage was a bespoke build it was ready in a matter of days with options for a very prompt delivery. My husband and I erected the cage (with help from one other for a few hours only) - it was straight forward and was up with netting and additional dear netting in two days! I am delighted with this product, the quality of the cage is excellent and I would not hesitate to recommend it to anybody. Thank you Harrod Horticultural, Adam and the team." "Design was good and the result pleasing. The quality of materials was very good and we look forward to many years use. The site was not level and it took some time to ensure the result was level throughout, made easier by the separate ground spikes and uprights. I erected the cage on my own – took some time, but pleased with the result. The door catch is a bit fiddly, but gives a secure fastening. We now await a harvest!" 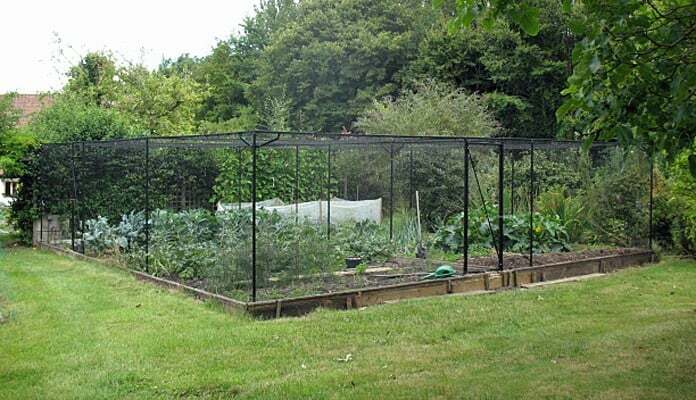 "The cage on our allotment. 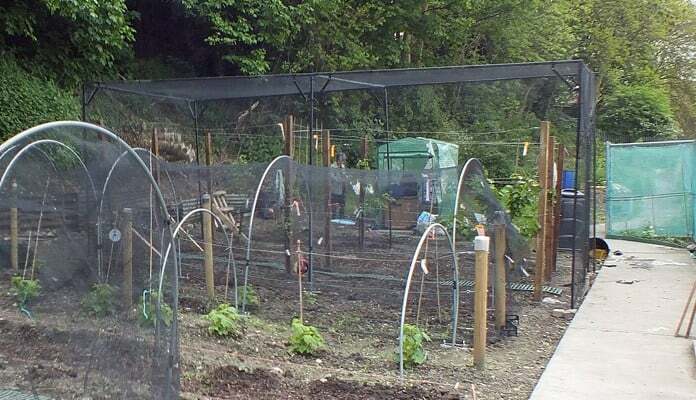 Very pleased with it, also pleased with your hoops, netting is very good at keeping out the Cabbage white butterflies but will let the bees get in to polinate the flowers. No fruit yet as this is our first year. Hoping for a better harvest next year." "No intruders to date, so doing the job. Wood pigeons are the main threat but rabbits are becoming more common year by year. Have not yet had to trench for chicken wire. The frame is on a site sloping 450mm over the length so a great deal of adaption needed on uprights plus some earth moving to ensure cage was horizontal. The ground fixings are of my devising, using foot plates and metaposts concreted in permanently. Spikes wouldn’t do the job. The service was fine, but there was a fair amount of tooing and froing as I changed my mind on the design and I ended up with a cage of 10.5 x 10.5 instead of 10.5 x 8." "The heavy duty steel walk-in cage you supplied is excellent. I am very pleased with the quality. It is proving to have no problem standing up to the strong winds that we experience where it is situated. The 'Butterfly Ball' now takes place on the wild flower patch, and tough curly kale, instead of my winter greens….Hurrah."